ACT Fibernet, a popular optical fiber-based Internet service provider in India launched Gigabit Internet in Hyderabad last year making it the first city in India to get 1Gbps internet speeds. The service was later then launched in Bangalore too. 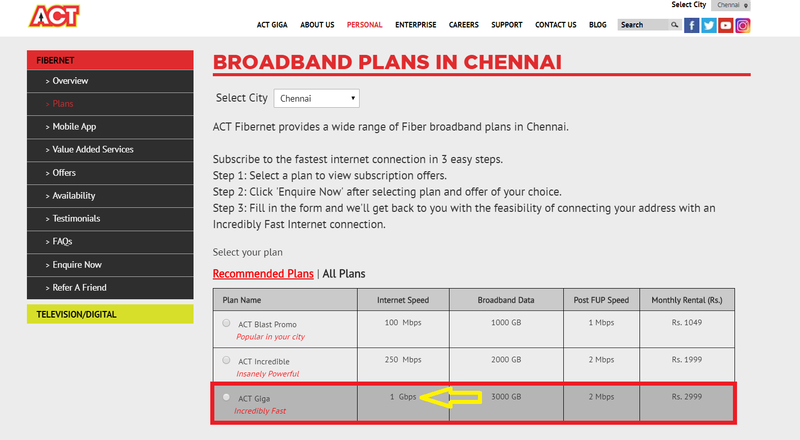 ACT Fibernet has different prices for Gigabit plans in Hyderabad and Bangalore. The company has been known for offering faster internet speeds at an affordable price. 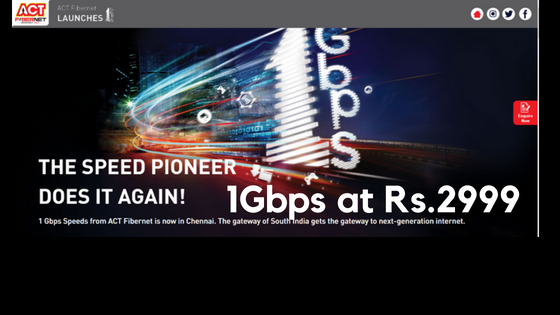 Today, ACT Fibernet has brought Gigabit Internet to Chennai. ACT is offering 1Gbps internet speeds at a price of Rs.2999. The FUP is capped at 3TB(3000GB) and the speed drops to 2Mbps post FUP. But 3TB should suffice most of the users. The best part about this plan is that the pricing is the cheapest in Chennai city compared to ACT Giga plans in Hyderabad and Bangalore. ACT Giga plan in Hyderabad costs Rs.5,999 and comes with 2TB Data as FUP. In Bangalore, the Gigabit plan is priced at Rs.5,999 as well and comes with 2.5TB Data. The post FUP speeds are 10Mbps in Hyderabad and 1Mbps in Bangalore. ACT Giga Plan in Chennai costs Rs.2999 and offers 1Gbps speed along with 3TB Data. There are also offers on advance rental for Gigabit plans too. If you pay for 6 months, you get 1 month free and if you pay for 12 months, then you get 2 months free. It is to be noted this plan doesn’t come with Google Home Mini as a freebie. Previously, Cherrinet launched 1Gbps internet in Chennai and it was priced at Rs. 10,000 for 2TB data. Recently at the Annual General Meeting of Reliance, we saw Reliance announcing Gigabit Internet in India. The registration will be live for Reliance Giga Fiber from 15th August onwards. Considering the impending launch of Reliance Gigabit Internet, the pricing from ACT seems very good. Let us know your thoughts on ACT Fibernet Gigabit Internet in Chennai!